Has your dad got loads of old ties he no longer wears? 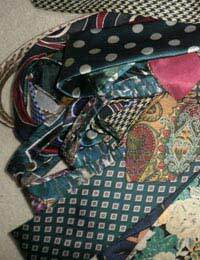 Or, do you often see brightly patterned ties in charity shops but can’t think of a way to wear them? Enter the necktie skirt! These skirts have a quirky twist and you’re sure to get people asking where you got such an unusual item. Between 7 and 10 ties – 100% silk are recommended but why not experiment? First things first – you’ll need to know the size of your hips and waist and to know where you want the skirt to end (for example, do you want a mini, a calf-length number or something in-between?). Measure the smallest part of your waist (near your belly button!) and the fullest part of your hips. You need to remove the labels from the ties and unpick the back seams, being careful not to tear the tie fabric. The best tool for this is a seam ripper. Be careful and patient with this task or it’s easy to rip the ties. Remove lose threads etc. and press the creases out of the tie. It’s best to use a hanky or other cloth between the iron and the tie to prevent damage. Cut the ties to the length you want them to be. Measure upwards from the wide part of the tie, not downwards.Lay the ties out in the order that you will sew them together – in a circle is best. Add ties until you have enough for the measurements you took earlier. Don’t forget to take into account that the seams between the ties will reduce the measurement. You should allow for half an inch seam allowance per tie (this accounts for both seams). Next, sew the ties together – Start stitching the ties together from the widest part (at the bottom) and stitch upwards. Don’t forget back-stitching to strengthen the seams. When you get to the final two ties, leave space for a zip. Put in an invisible zip. Next, you need to make a waistband. Cut the tie to fit your waist measurement. Fold the waistband in half – wrong sides together – and press. Sew the ends together to make a loop. Finally, pin the waistband to the skirt and stitch. Now it’s time to admire your handiwork and show off your skirt made from old ties. Don’t cut corners – your skirt will look better and last longer if you take the time to do things such as press it, remove threads and fit it accurately.